To see how our solar system arose, astronomers point their telescopes at young stars. But these stars are usually so far away that the view is murky. Now a stellar newborn has turned up on Earth's doorstep. Named AP Columbae, the star is so young it has yet to spark its main nuclear flame, and it's so nearby--a mere 27 light-years from Earth--that scientists might be able to glimpse the glow of orbiting planets still cooling off from their formation. A star arises when a cold cloud of gas and dust collapses under its own weight. As gravity squeezes the cloud, it grows so hot that it begins to shine--and a new star is born, but one powered by gravity rather than nuclear activity. Our Sun spent 50 million years in this gravity-powered "pre-main-sequence" phase before its core got so hot that protons smashed together to forge helium, the same energy source the Sun taps today as a so-called main-sequence star. AP Columbae lies in the constellation Columba the Dove, south of the brilliant constellation Orion. 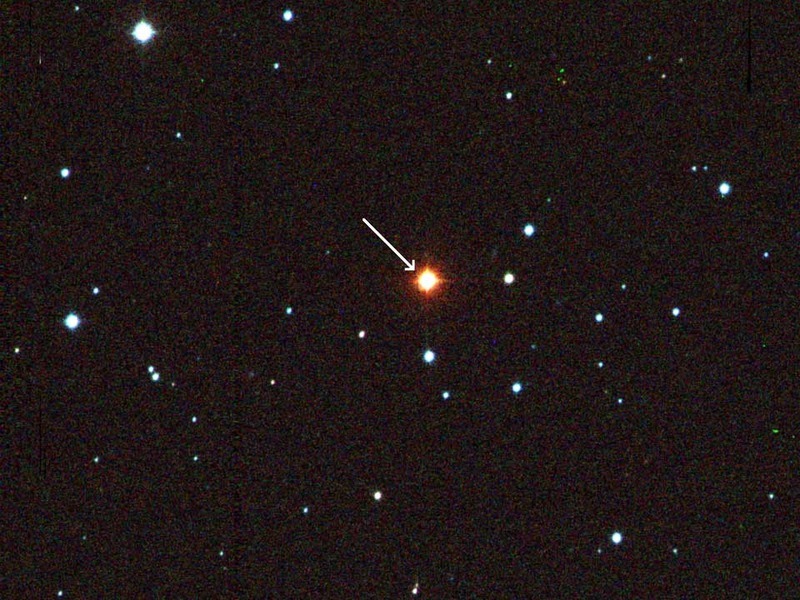 "AP Columbae is still contracting under gravity towards the main sequence," says astronomer Adric Riedel of Georgia State University in Atlanta, whose team measured the star's parallax--an indication of its distance--and discovered that the star is abnormally luminous. Although the star is dim and red, it's four times as bright as it should be, because it's twice the diameter of a main-sequence star of the same color. "They did a super careful job," says astronomer Steven Stahler of the University of California at Berkeley. "This really is a pre-main-sequence star." AP Columbae has a strong magnetic field that unleashes bright flares, he notes, suggesting that astronomers may be able to use it to study magnetic fields "up close and personal." But how did a star as young as AP Columbae end up so close to Earth? Riedel points to a young star cluster named IC 2391 that resides 450 light-years away in Vela, a constellation near Columba. He suspects a star in that cluster exploded, shooting out gas filaments that spawned stars over a vast region of space. Although separated by hundreds of light-years, these stars move through space together--like a flock of geese heading south--in a group called the Argus association. AP Columbae shares the motion of the Argus stars, so it likely formed when they did, about 40 million years ago, making it just 1 percent as old as our Sun.